We had a hard frost last night, and I was greeted by the icy eye of the moon when I left for work. Later, I walked down the hill to check something in our box area greenhouses, down to where the sun doesn't shine due to the nearby woods. My God it's cold down there. 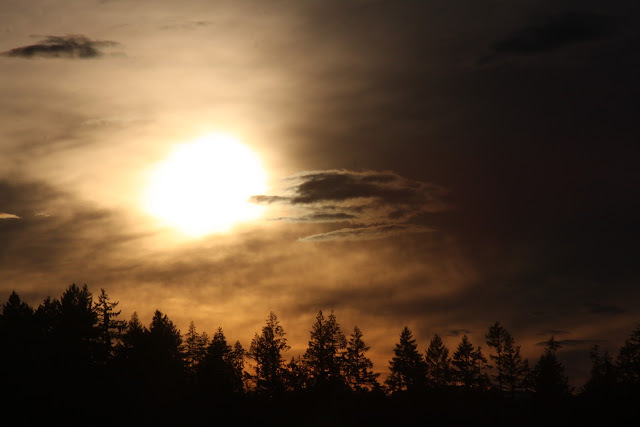 Then I walked back up the hill, into the warmth of the winter sun. 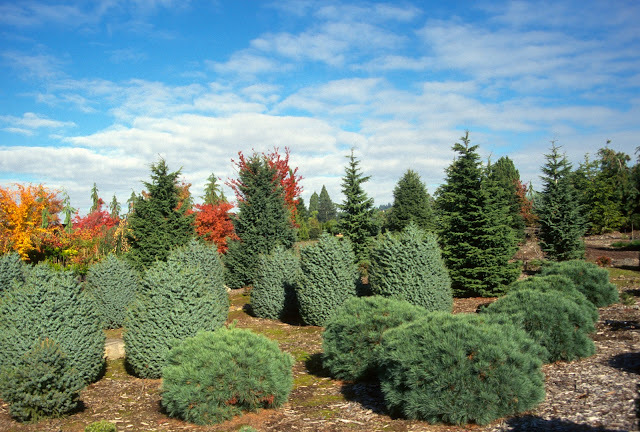 My mood changed to bright and happy, with the conifers in the Blue Forest looking especially nice. 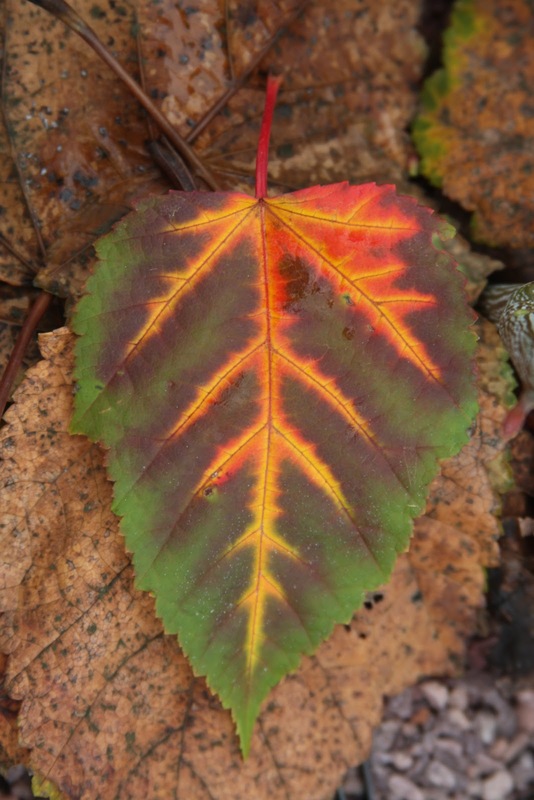 So I retraced my steps and wrote down a few plant names, aware that this blog thing needed attending to. 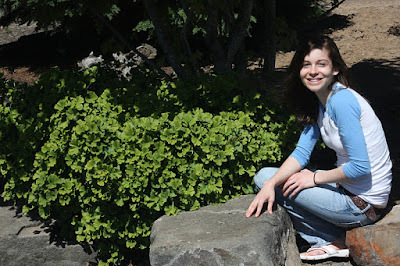 First of all, the Blue Forest was a large garden where every plant displayed blue foliage. In the early 1980's I guess I thought that was a cool idea. 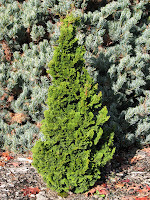 I eventually tired of it, and removed most of the spruces and pines, but left seven old "mountain hemlocks," Tsuga mertensiana--which would be criminal to cut down. 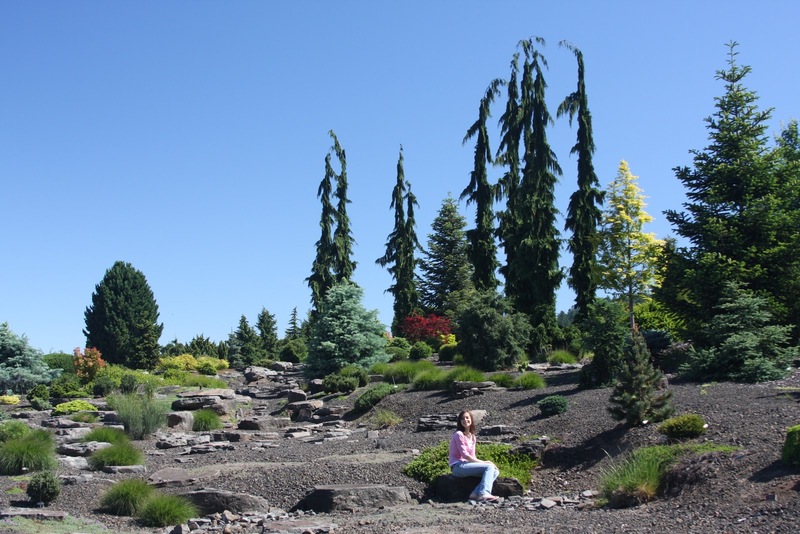 The Blue Forest is now largely a rock garden, planted with a lot of interesting trees of all colors. 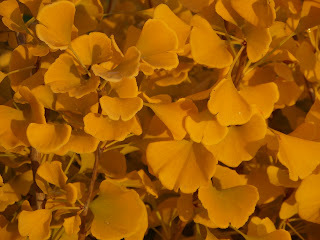 Ginkgo biloba 'Marieken', a dwarf European selection, looks pretty in spring and summer, then absolutely fantastic in autumn. This cultivar was new to me in fall of 2000, when I saw it in Germany and Holland. In the trade it is also spelled "Mariken." I actually have two labels, one from Holland and the other from Germany, where the two spellings occur. But "Marieke" is a fairly common Dutch woman's name--and I actually know a Marieke (Kemper) who confirms my spelling. 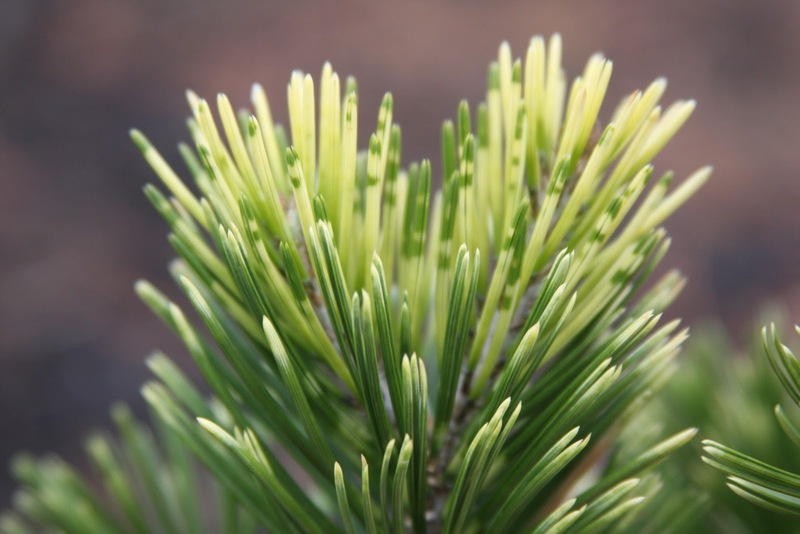 Thanks to our propagation department, the plant is grown by many American nurseries now. 'Marieken' is a spreader, growing to one foot tall by three feet wide in ten years, with leaves almost the size of regular Ginkgo. 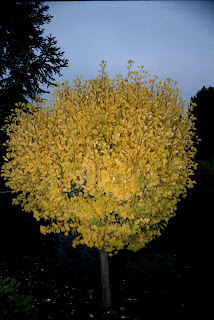 Another dwarf, Ginkgo biloba 'Munchkin' is a real cutie. Its leaves are remarkably tiny, with barely any indentation between the lobes. 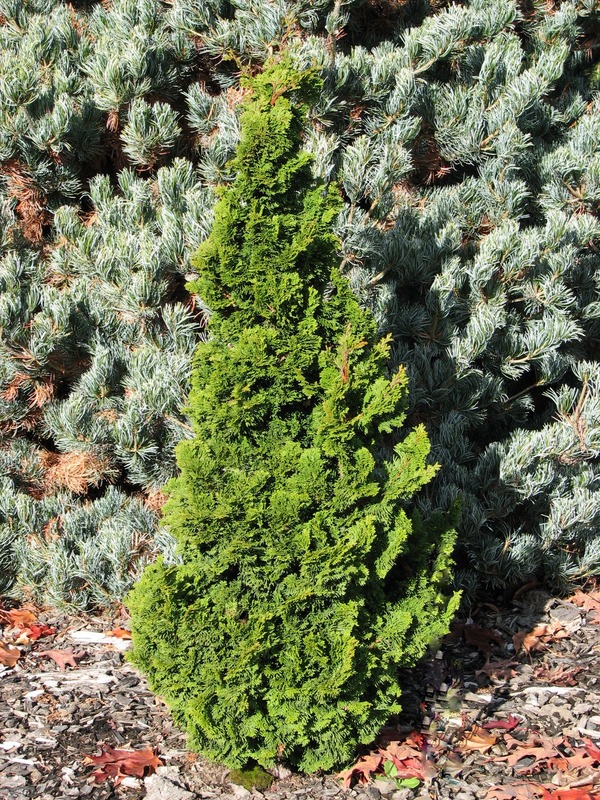 'Munchkin' is a slightly more upright cultivar, growing to two feet tall by one and a half feet wide in ten years. 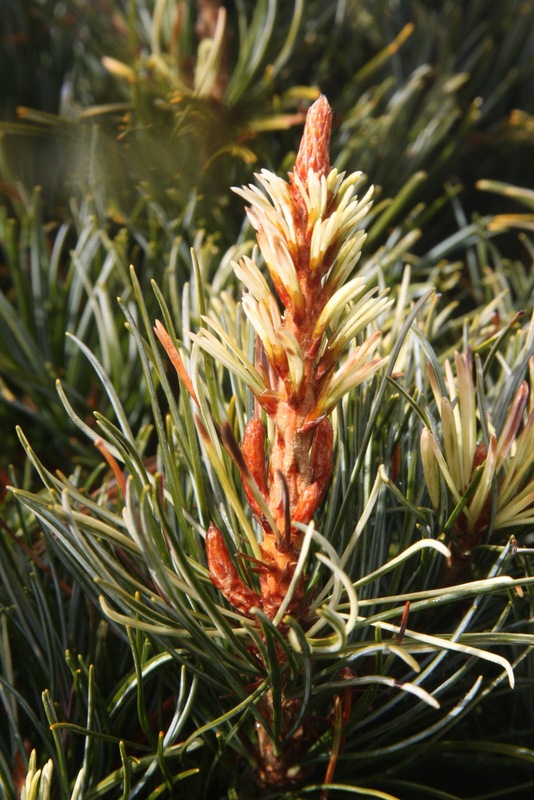 We grow a large number of Pinus parviflora cultivars, nearly one hundred, and they each have their own individual charm. 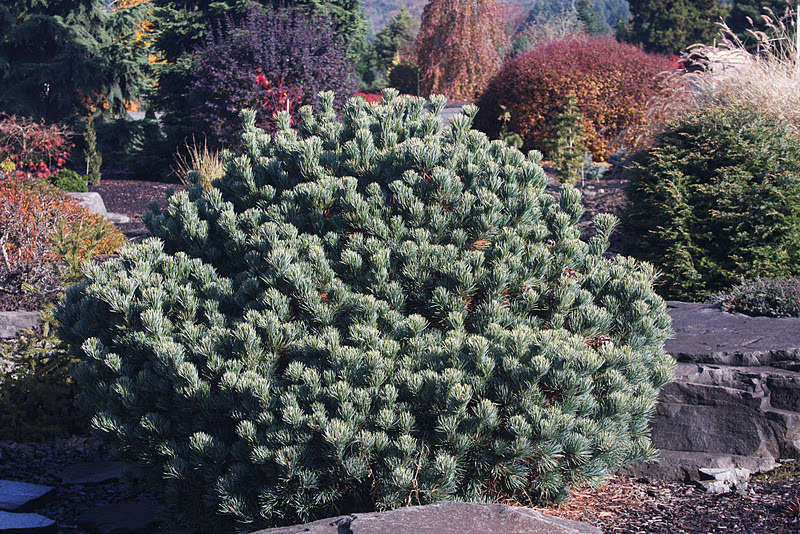 But perfect for the rock garden is Pinus parviflora 'Aoi'. That is "blue" in Japanese, and it is pronounced "owee," like when you stub your toe on your way to the bathroom in the night. 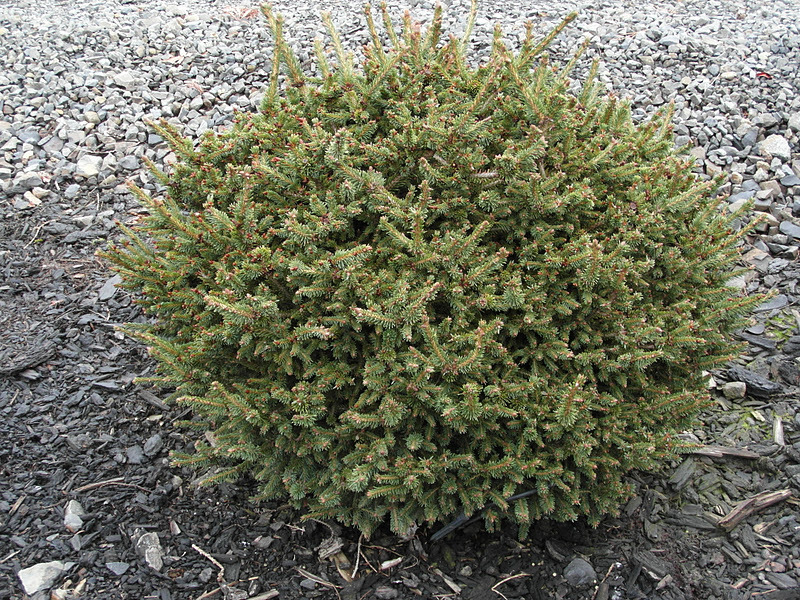 'Aoi' is a dwarf blue ball for many years, but eventually will form a leader. 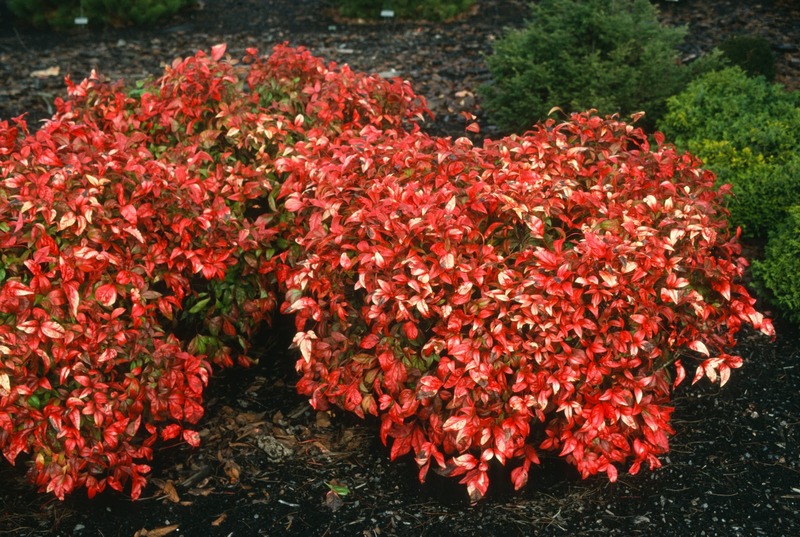 It should be grown in full sun for best color, and as with all of the parvifloras, good drainage is a must. Pinus parviflora 'Blue Giant' is a fabulous selection with a pyramidal shape. 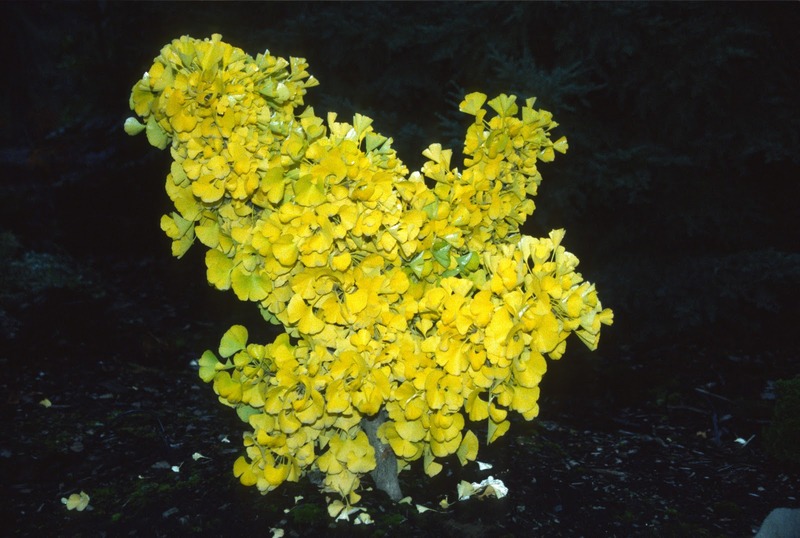 It was selected in Holland in the 1970's and given its English name. 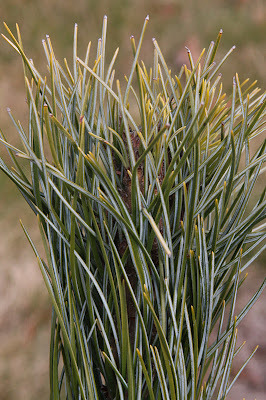 While the lustrous silver-blue needles are slightly longer than the type, it is certainly not a "giant" in rate of growth, achieving only about six feet tall in ten years. A few knuckleheads suggest that 'Blue Giant' is the same as 'Blue Angel' or 'Blauer Engel', a similar selection from Stockmann's Nursery in Germany. But they're not the same, I think. Besides, 'Blue Angel' is patented now, by a large Oregon/California company, even though I was probably propagating it before the patent took effect. 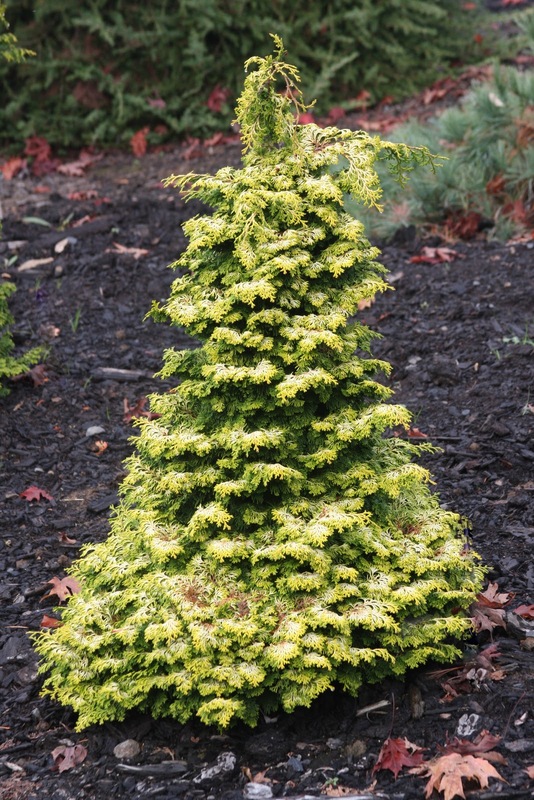 Chamaecyparis obtusa 'Golden Pillar' and 'Vokel's Upright' are similar in form (narrow uprights), with 'Golden Pillar' slightly slower due to its rich golden foliage. I've made a drift of these little sentinel creatures, and they look very nice together. 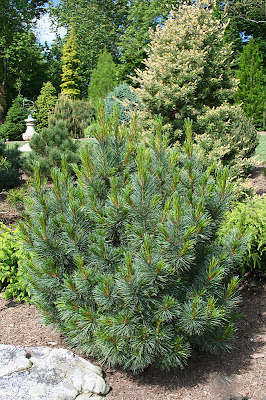 Likewise, two spruces are quite similar, Picea abies 'Stoner' and Picea abies 'Kluis'. The 'Stoner' was given to me by Greg Williams of Kate Brook Nursery, and was listed as 'Stoner #2'. I never did see a 'Stoner #1'. And of course 'Stoner' brings out chuckles with many who encounter it for the first time. The 'Kluis' was given to me by John Mitsch of Oregon, now retired, but one of the greatest plantsmen in his day. 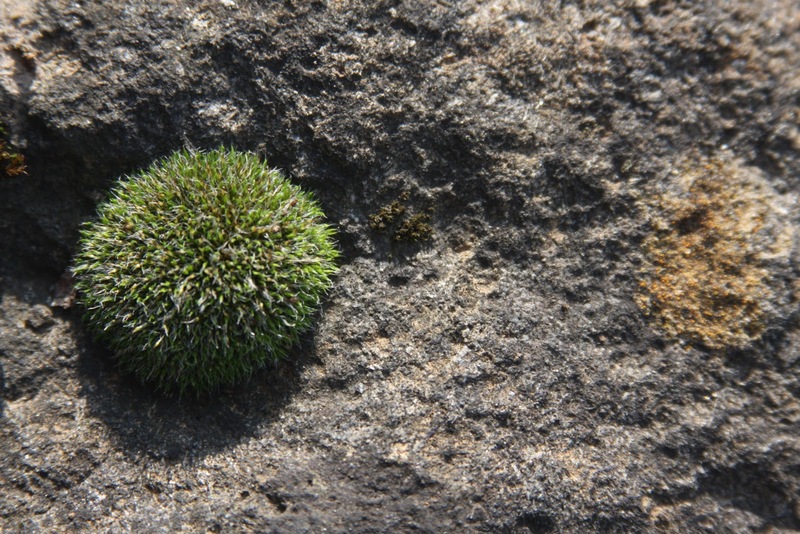 Both of these gray-green cultivars start out as round or irregular balls, but usually a leader will develop. They are perfect in a rock garden, looking like denizens of an alpine region, and never outgrow their place. One of the largest plants in the Blue Forest is Pinus cembra 'Glauca'. 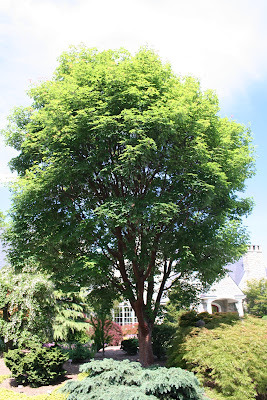 This venerable tree is about fifty years old, and makes a dramatic silver-blue exclamation point. 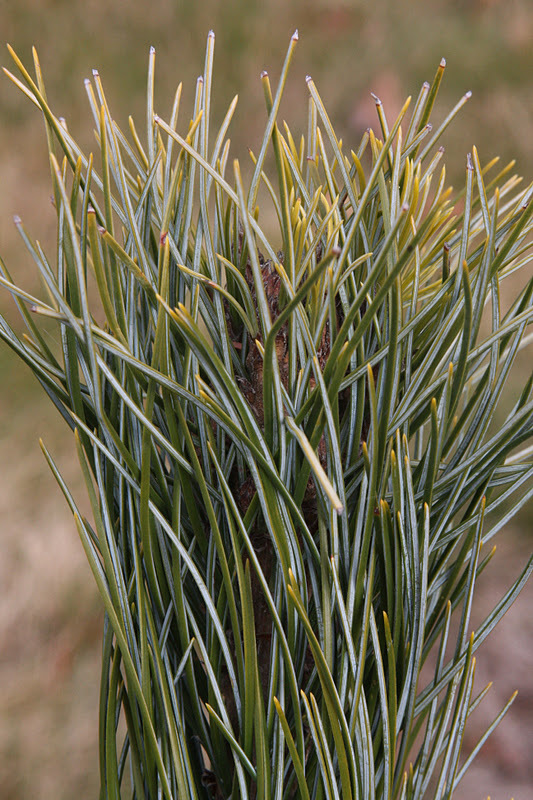 We grow many cultivars of cembra pine, and even the most robust are still slow-growing. 'Blue Mound' is a dwarf, and while the original tree was a mini mound, most grafted trees will develop a leader. 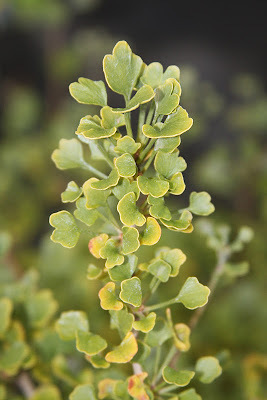 But still, it is a nice cultivar, and not so rare in the trade. I like 'Big Blue', a selection from Johnson Nursery in Wisconsin, "Doncha know." It grows at the same rate as 'Glauca', about six feet tall by three feet wide in ten years. 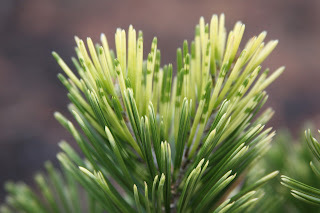 Well, there are so many great plants in the Blue Forest, mostly conifers, and every once in a while I'll rediscover one that I couldn't remember being there. 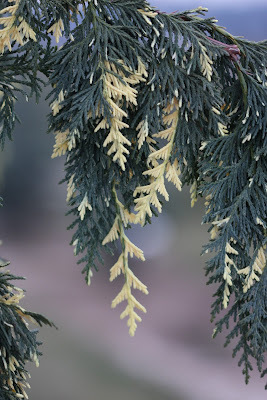 Probably the signature trees are the Chamaecyparis nootkatensis 'Green Arrows'. 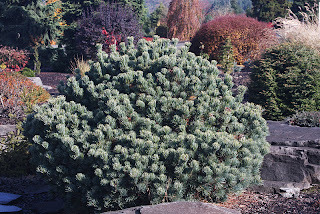 They are possibly the oldest and largest in the world, as I introduced the plant into the USA gardens in the mid 1980's. 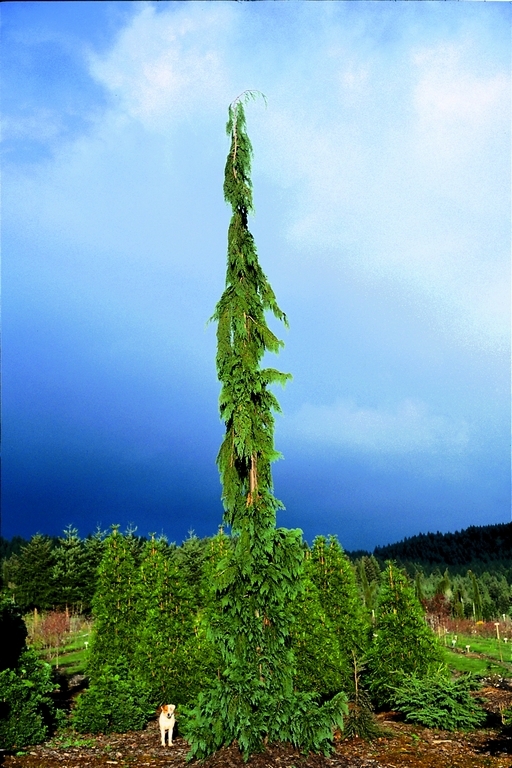 The late Gordon Bentham discovered the tree on Vancouver Island, on government land, but was denied cuttings from it by some pompous little official. Of course Bentham stood at a higher moral level, got the cuttings anyway, and today thousands of gardens are graced by his efforts. 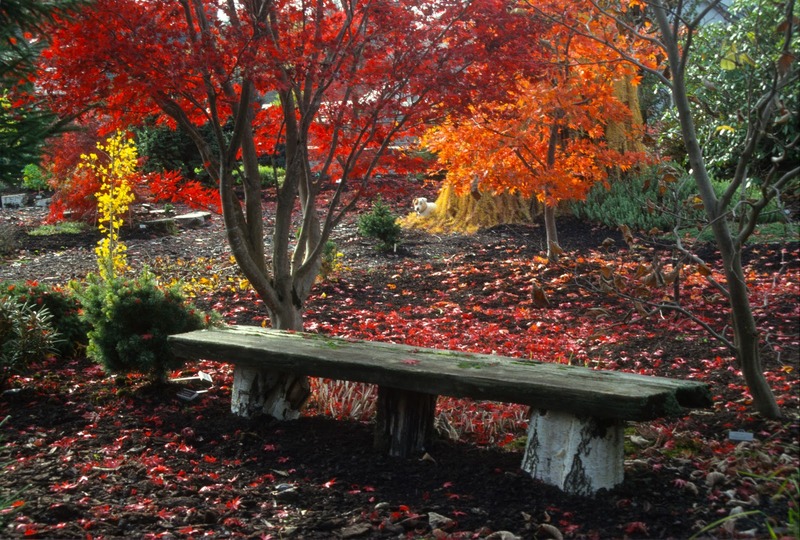 The Blue Forest looks good in any season; the plants and the granite stones make great companions. 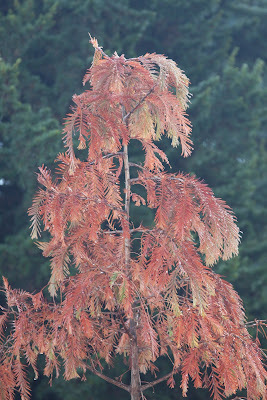 But it is always changing, with trees occasionally coming out, and new ones going in. 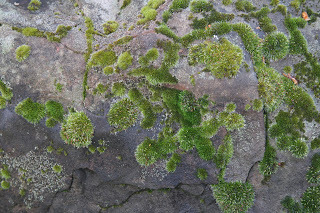 And I guess the stones are changing too: the patterns of moss and lichen are evolving, while the rocks continue to sink a fraction, year after year. 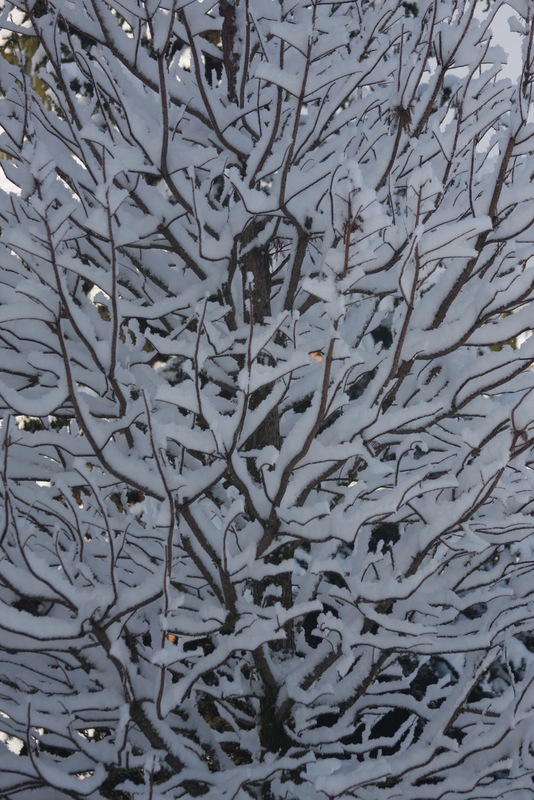 Winter officially begins on December 21st, but we've been in the "dead of winter" for some weeks now. We come into work in the dark, lock up and go home in the dark, traversing icy roads or through thick fog. Year after year after year. Perhaps the best cure for winter's blues would be a hot toddy to start the day, except then we would fall asleep by 10 AM. 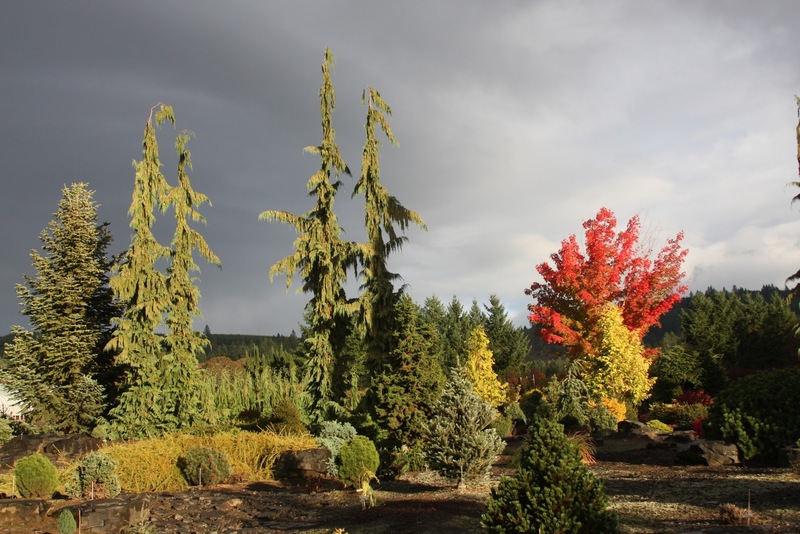 But the crew at Buchholz Nursery has game in all seasons, fully realizing that a cold job is still better than no job. For me, I bundle up and take a walk through the collection. 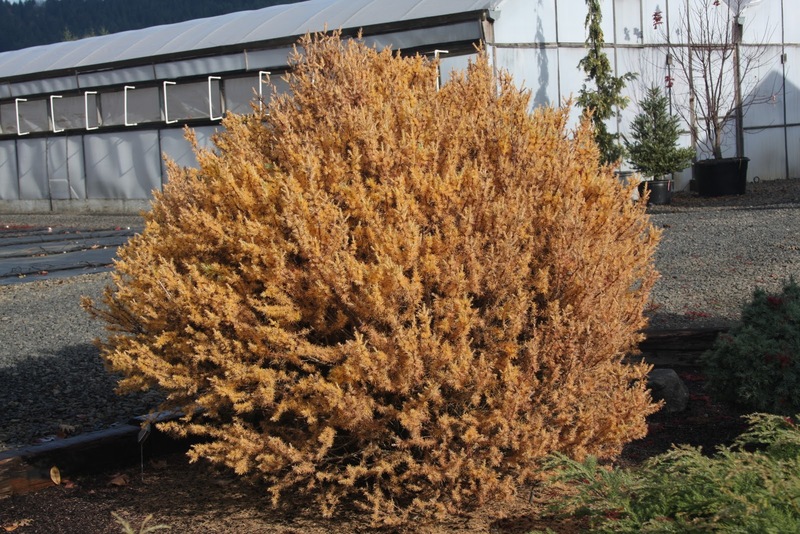 Many plants are better than ever in the winter. 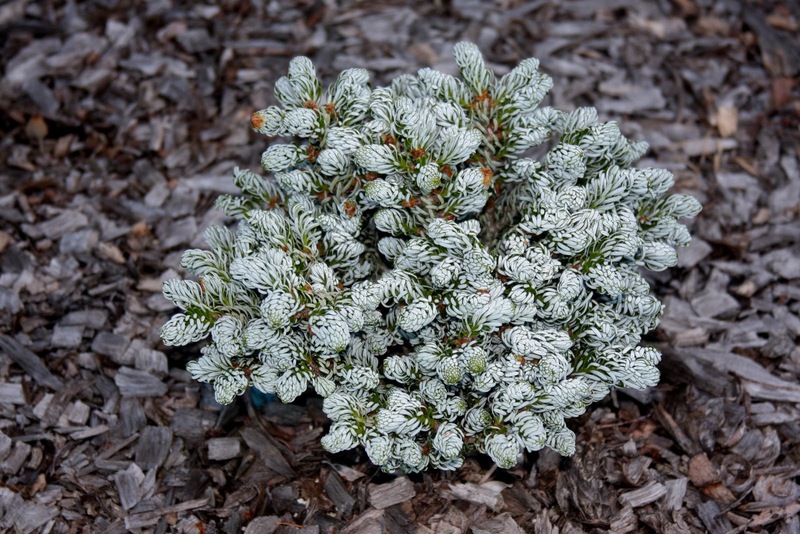 Chamaecyparis nootkatensis 'Sparkling Arrow', a new cultivar with cream-white variegation on dark blue-green foliage, shows color that actually intensifies when cold. 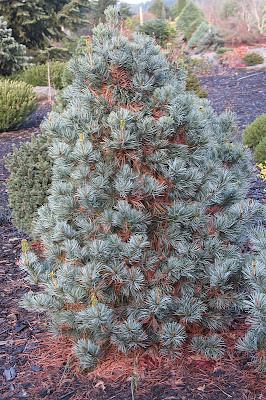 The same is true for Pinus cembroides 'Pina Nevada'. 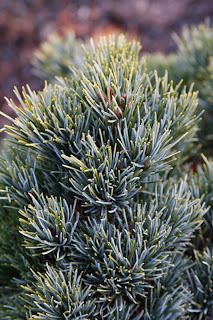 The species, known as "pinions" or "nut pines," occur from the southwestern United States to north and central Mexico. 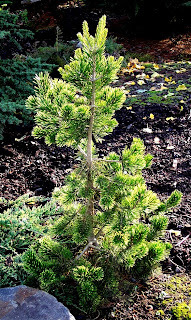 I was given scionwood in the early 1990's from the late J.C. Raulston, from a variegated seedling found in Mexico on a plant-hunting expedition. You can google 'Pina Nevada' and see photos of the remarkable discovery. The tips of the gray-green needles are variegated in sparkling cream-white, notable and pleasing in spring and summer, but absolutely brilliant in winter. 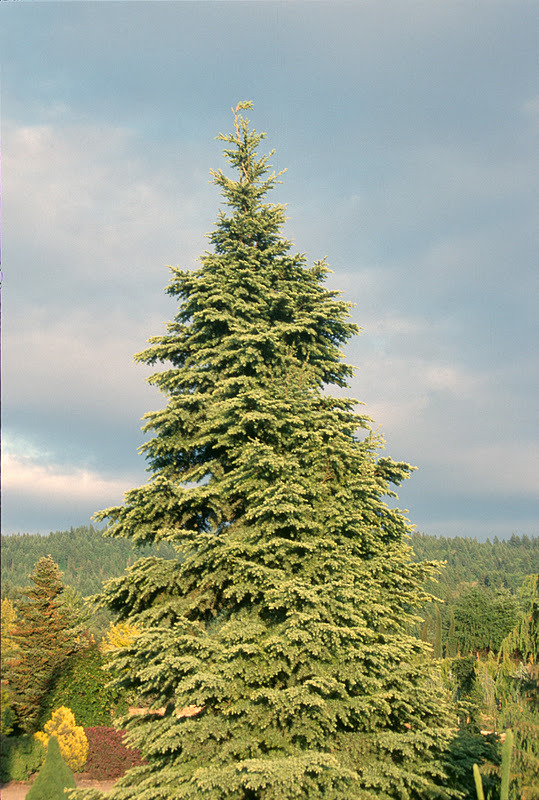 This is not a strong-growing cultivar--my nearly twenty-year-old tree is only 7' tall--and it eventually assumed an "alpine" form. Due to the slow rate of growth, we sell this only as a one-year graft; I'd be dead before we could ever have a crop salable in the field. Another pine which lights up our winter garden is Pinus parviflora 'Tanima no yuki'. 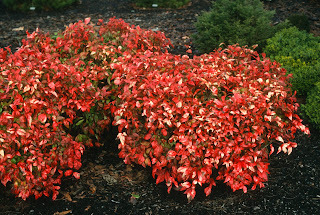 This choice dwarf cultivar was originally imported into America from Japan, with the spelling very wrong. For years it was called "Tani-Mano-Uki." The problem is that none of these three words exist in Japanese, nor should there be dashes between the words. 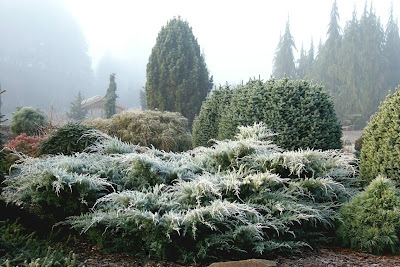 One day my Japanese wife and I were walking through the garden, and I asked her what the name meant--I was told previously that it was "snow on the mountain." 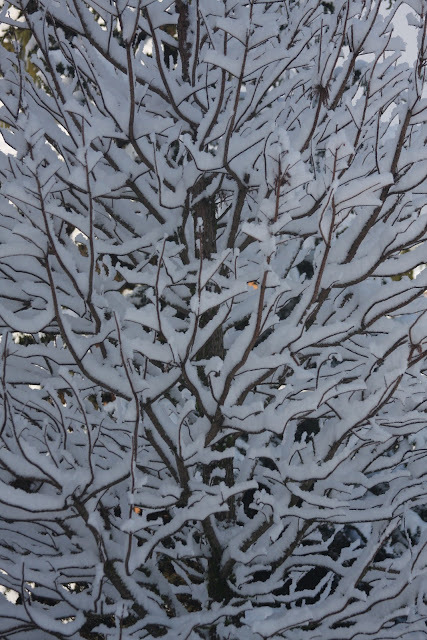 "Yuki" is snow, not "uki." "No" means "of." "Tanima," not "tani" means "valley." So my Japanese Sherlock pronounced "Snow of the valley," not "Snow on the mountain." In fact, "tanima" is a crude word Japanese men use to refer to a woman's cleavage. The correct spelling and meaning is gaining in use now, all thanks to my wife. Well anyway, she doesn't really care about the spelling, she just likes the plant. 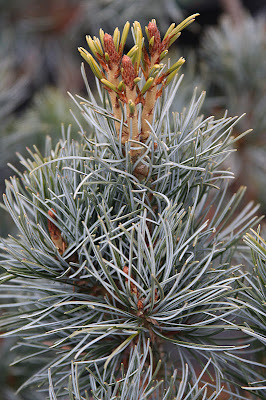 In spring, new growth can have a pink color, with little white needles. 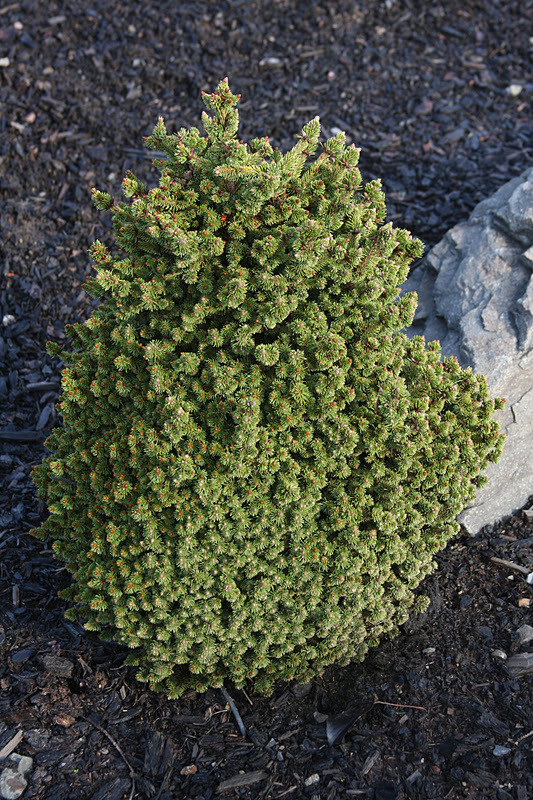 Older foliage is dark green with silver undersides. In Oregon, it is probably best with afternoon shade, since we have very little humidity when it's hot. 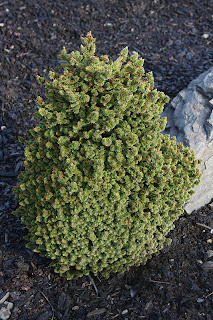 My original plant is about twenty years old, and is two feet tall by three feet wide. 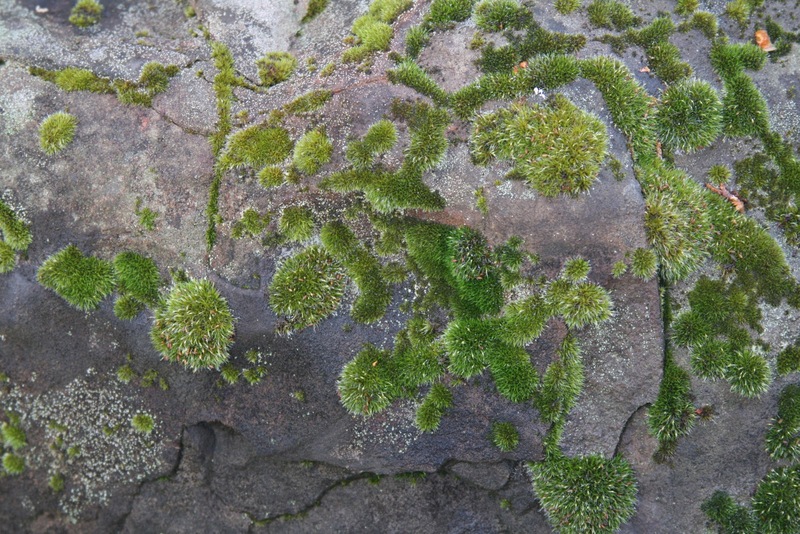 'Tanima no yuki' is usually offered as one-year grafts, or as five-to-six-year olds in pumice stones, and we always sell out. 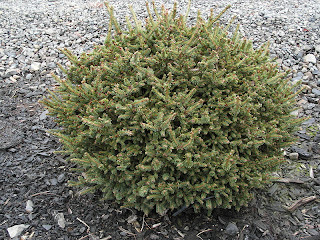 Also very quick to sell out is Abies koreana 'Ice Breaker', which we offer in pumice stones. 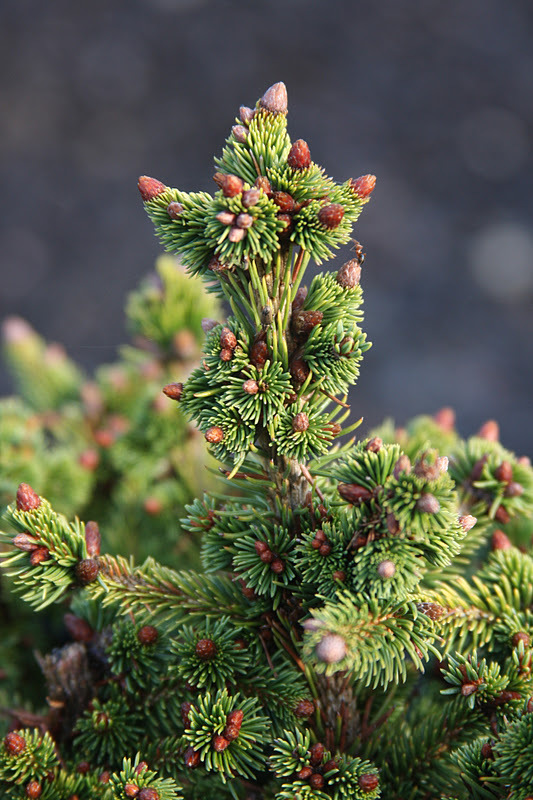 'Ice Breaker' was originally listed as 'Kohout's Icebreaker', as it originated as a witch's broom mutation on an Abies koreana 'Silberlocke', discovered and introduced by Jorg Kohout of Germany. 'Ice Breaker' is a compact, spreading cultivar, with even more of the needles silvery undersides in display than the 'Silberlocke' parent. Some may eventually develop a leader, but for now our plants have not. It will grow to 8" tall by 12" wide in 10 years if grafted onto a vigorous Abies rootstock, or more dwarf if propagated as a rooted cutting. 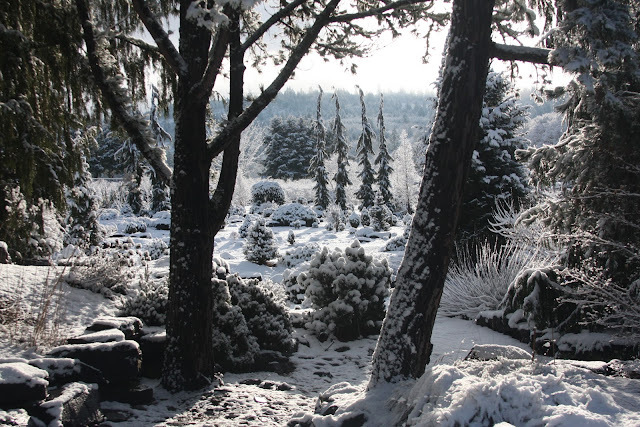 Now, there are so many plants that look great in our winter garden. 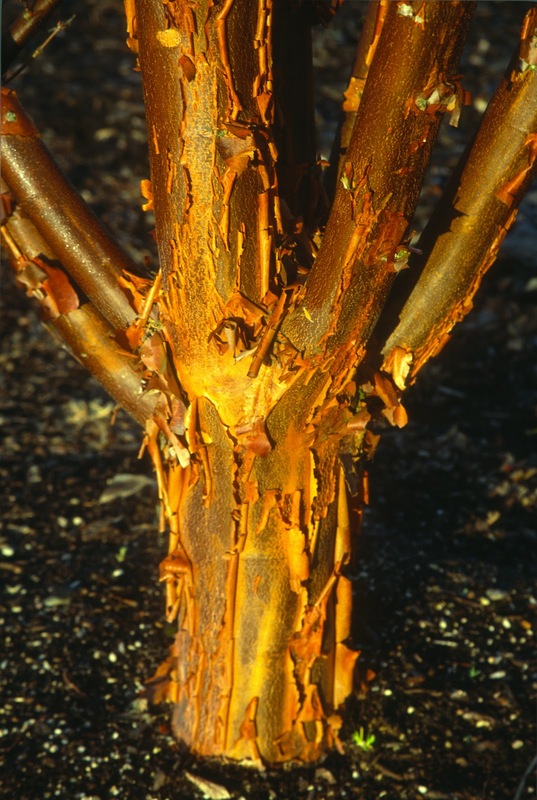 Acer tegmentosum 'Joe Witt', a striped-bark "Manchurian Maple" selection, features chalky-white bark. 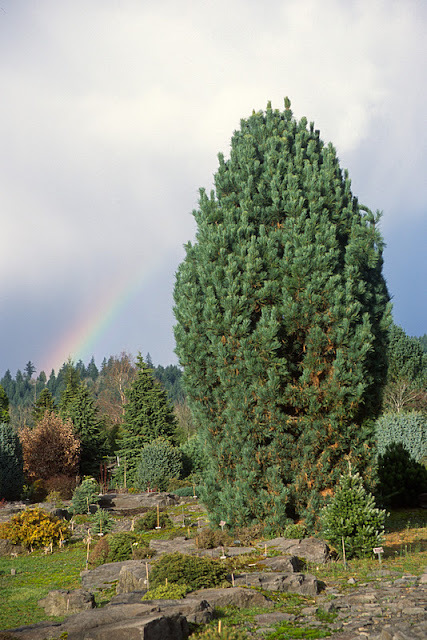 It was named for the late curator of the Washington Park Arboretum in Seattle. 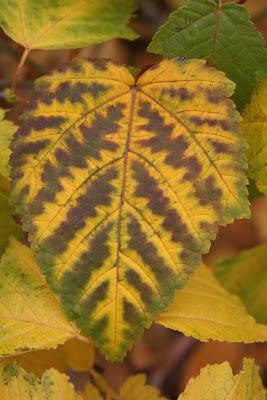 His daughter worked at Buchholz Nursery for a few years, and we were also given a start of another of Witt's selections, Acer davidii 'Serendipity. 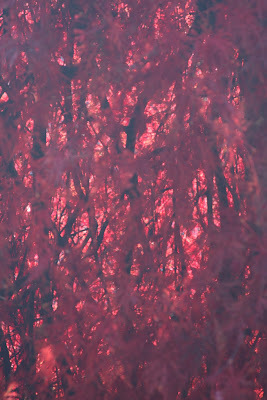 Of course the Acer griseums are fantastic in winter. Due to over-zealous seedling growers, griseums are readily available, and at a much lower price than a decade or two ago. 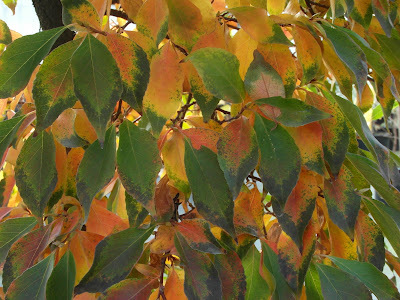 The same could be said of Stewartia pseudocamellia. 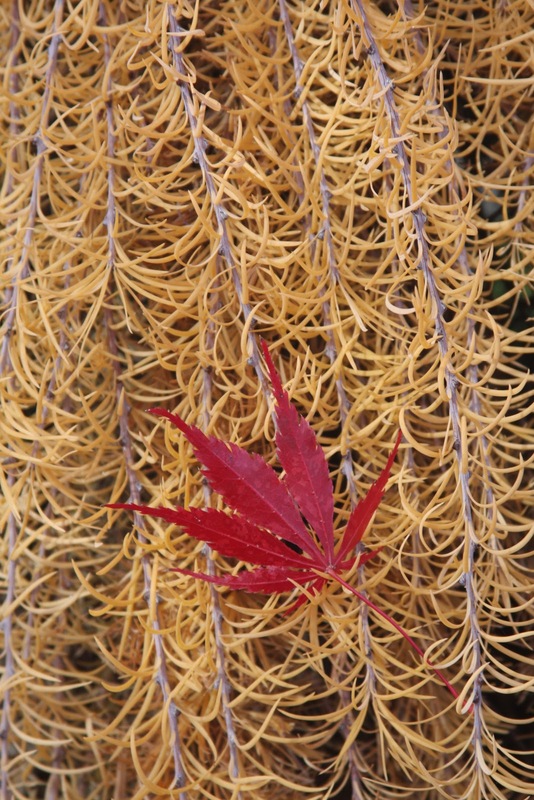 I continue to be impressed with the Acer griseum x Acer maximowiczianum hybrid, 'Cinnamon Flake'. The griseum species is native to central China, while maximowiczianum (more easily known as the "Nikko" maple) comes from China and Japan. The Nikko blood results in a tree with leaves and seed similar to Acer griseum, except much larger. 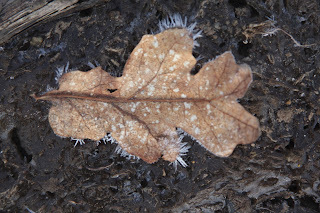 I'm also pleased with 'Cinnamon Flake''s robust rate of growth. 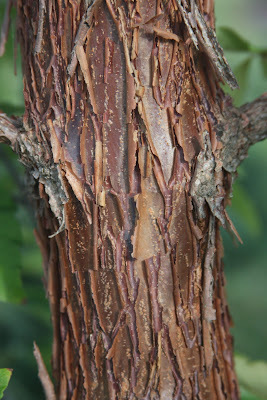 The bark doesn't peel as much as Acer griseum; it's more like a dark-brown version of Acer triflorum. I could go on and on about individual plants. Just looking out of the office window I see many more candidates. But just in general, the conifers seem to glow more in winter; the spruces are more blue it seems, the pines show off their buds, and cones hang like ornaments. 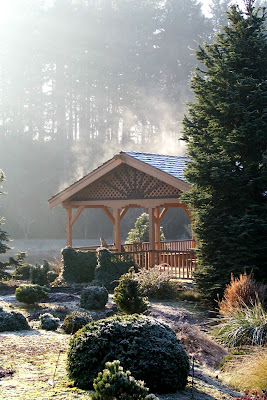 We've had cold, frosty and/or foggy mornings the past couple of weeks. For many that is depressing, but I get to come to work in a nursery with beautiful gardens. 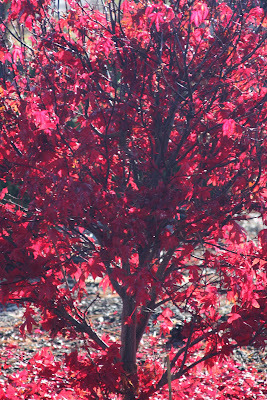 Autumn color this year was more vivid and memorable than ever…or so it seemed to me (again). I worried that I would miss it, all due to the European trip, but returned to a full month of enjoyment. Now finally all the leaves are down, raked and dumped onto the neighbor's property. We face four months of cold, fog and darkened gloom, just like the previous 39 years of my life. 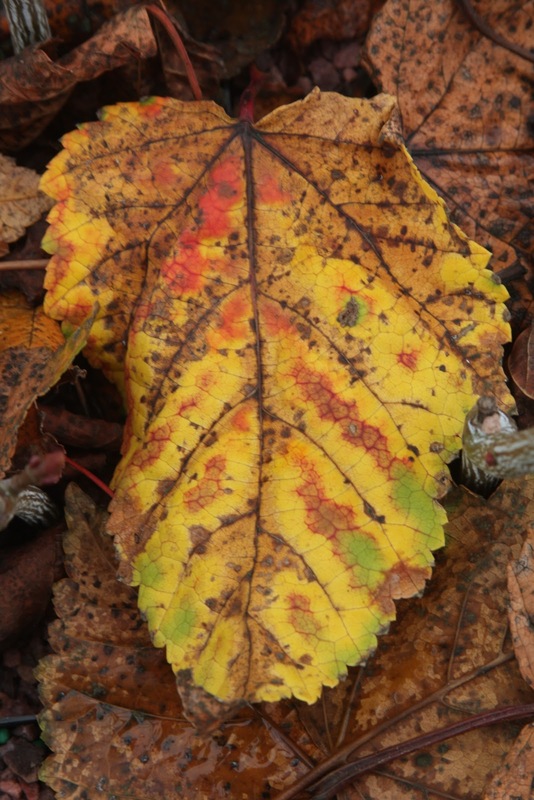 "Color" usually means deciduous trees with leaves, but that's not all. Larix, Taxodium and Metasequoia, aflame with straw yellow to burnt orange foliage, looked impressive, especially on rainy days. 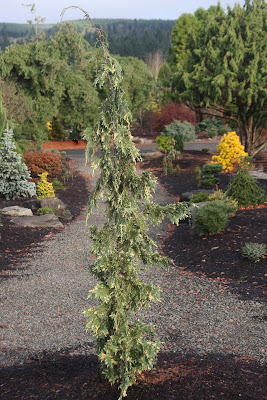 The old standby, Larix decidua 'Pendula', has indeed been "standing by" for a long time in our display garden; I would guess it to be 38 years old. My three older children used to hide in it, and demand that I try to find them, but every time I got near…their giggles would give them away. Larix decidua 'Puli' never disappoints. Its natural habit is that of a low, flat groundcover, but of course it can be staked into a narrow weeping tree. 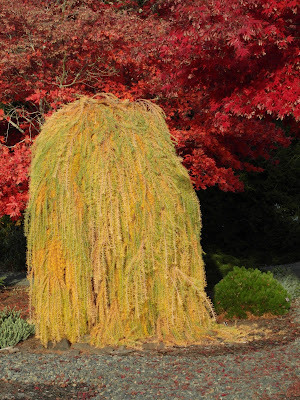 The cultivar name is derived from a Hungarian breed of dog which has curly hair that drops straight down. 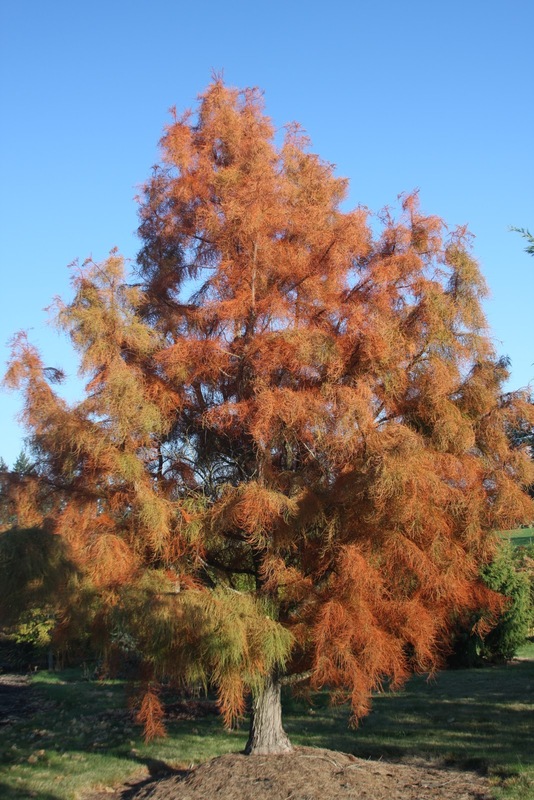 Larix laricina 'Blue Sparkler' could be called "Orange Sparkler," judging by its color now. 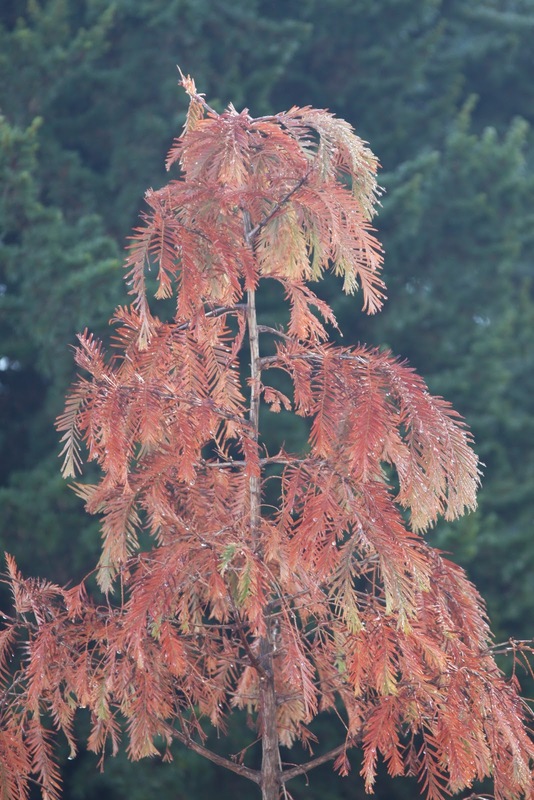 Metasequoia glyptostroboides 'Gold Rush', about 18' tall, was brilliant this year, and could be seen from the far corners of the nursery. 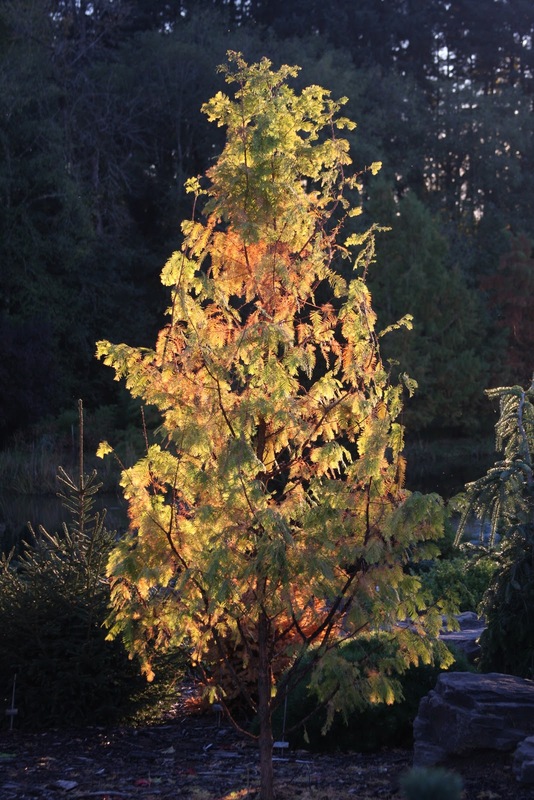 Metasequoia glyptostroboides 'Kools Gold', which in summer will prove more useful than 'Gold Rush' for those in hot climates, put on a glowing show with the back-light of the afternoon sun. 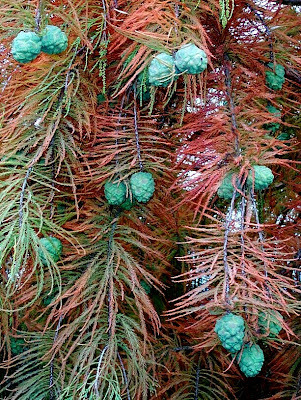 Taxodium ascendens, the "Pond Cypress," shines with orange while the blue-green cones dazzle like Christmas tree ornaments. The species "ascendens" is nomenclaturally comical, meaning ascending, as the branches certainly do, but combines with the cultivar epitaph, "Nutans," meaning "drooping, weeping or nodding"…it makes you wonder what's the what? 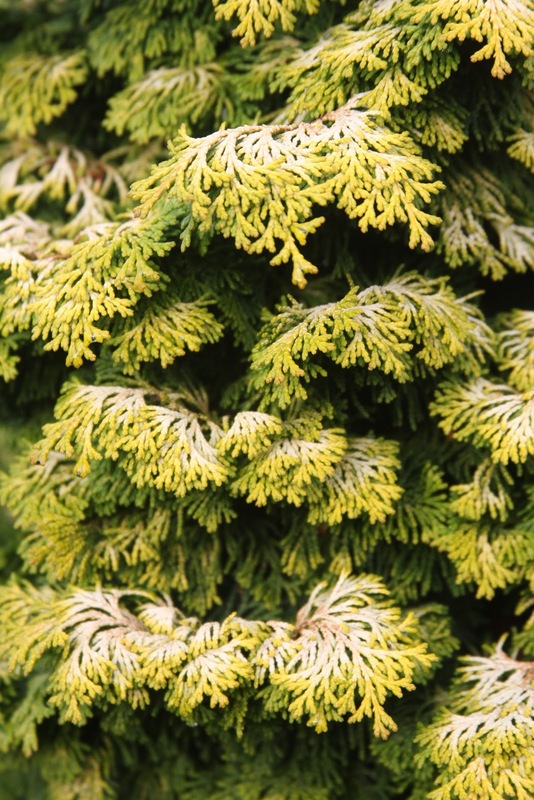 Well, both happen, and in fall, this soft-green conifer gives you a moment of horticultural delight. 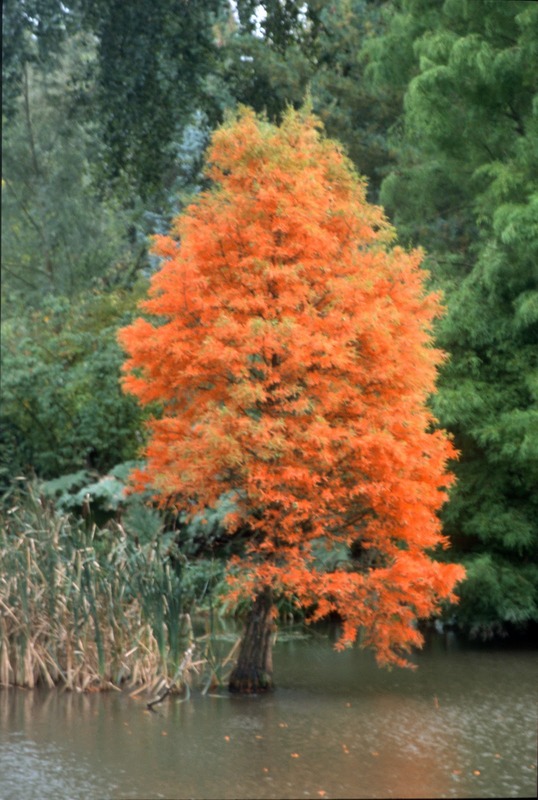 Taxodium distichum, the "Bald Cypress," is just as colorful. 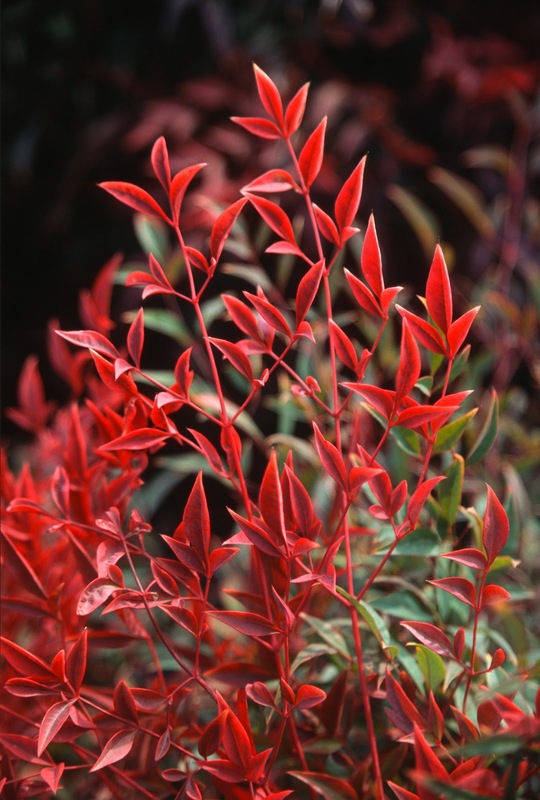 Who would think of the "Heavenly Bamboos" as fall-color champions, but certainly Nandina domestica provides an orange-reddish presence to the autumn landscape. 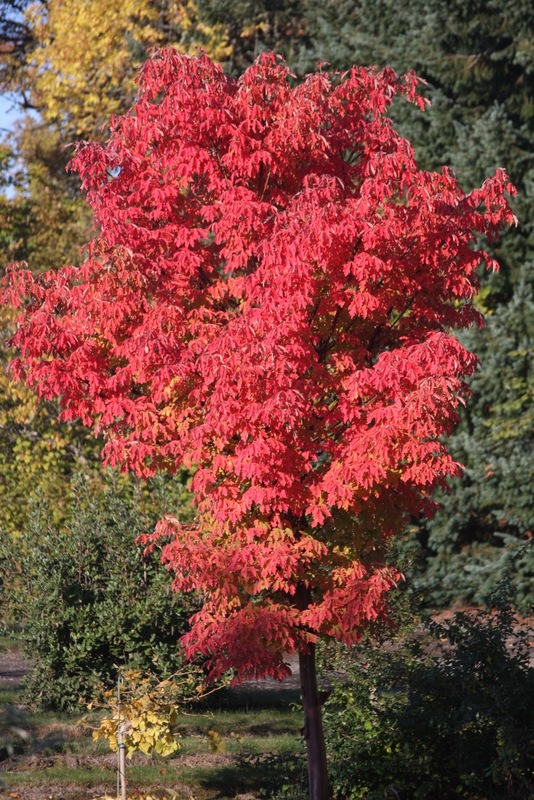 The cultivar 'Moon Bay' is wonderful in late November, and 'Wood's Dwarf', from Oregon's late Edsal Wood, develops into a spectacular orange-red ball, lasting throughout the winter. Perhaps the most fantastic of all is the cultivar 'Senbazuru', a charming little curiosity with tiny, wiry leaves. 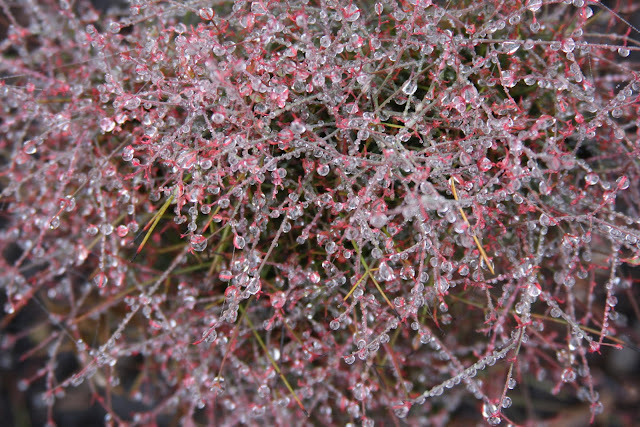 This little miniature treat turns to red in November, and is delightfully bejeweled with sparkling silver pearls when it rains. 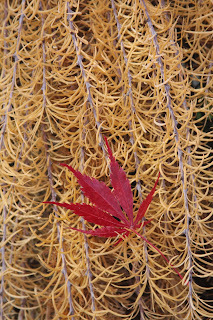 Ok, let's get to the maples. 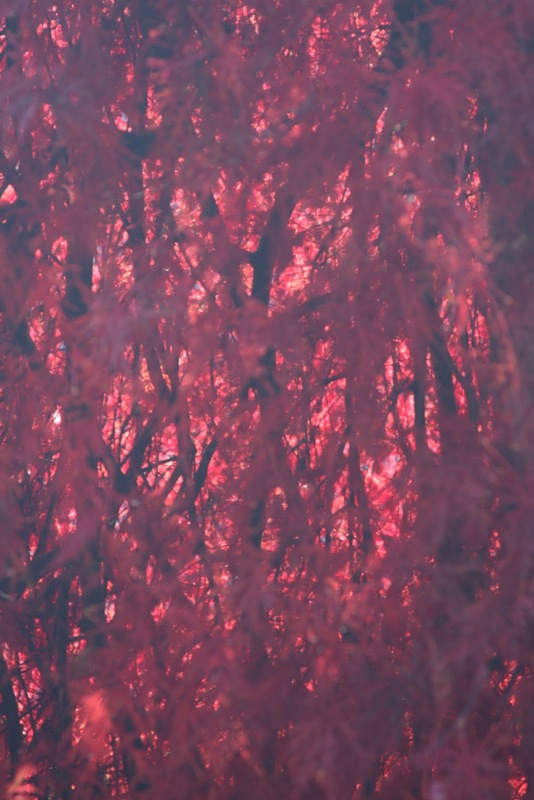 Whenever I invite someone to visit the nursery in autumn, I am usually thinking that they'll get their money's worth with a tour of the Acers. 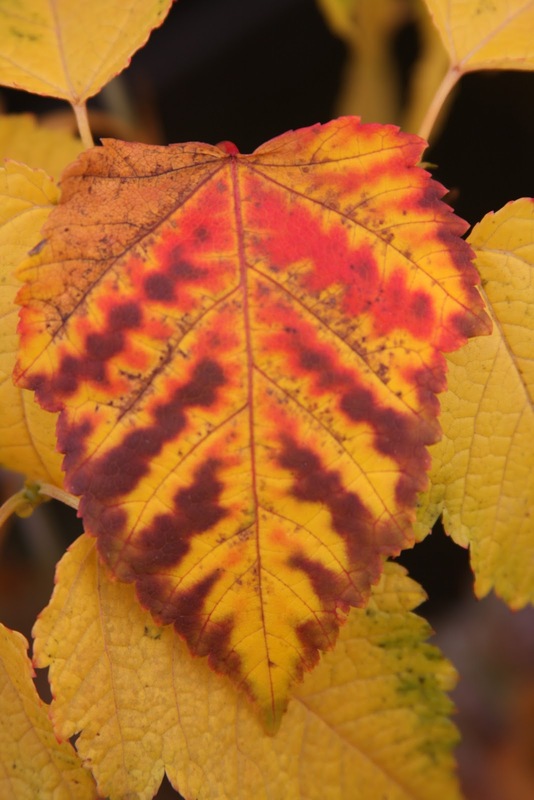 August, September and the first of October can be dreadful in a maple nursery, the fresh spring leaves are ravaged by long 95-100 degree weeks, but fall color is the redemption that we so long await. 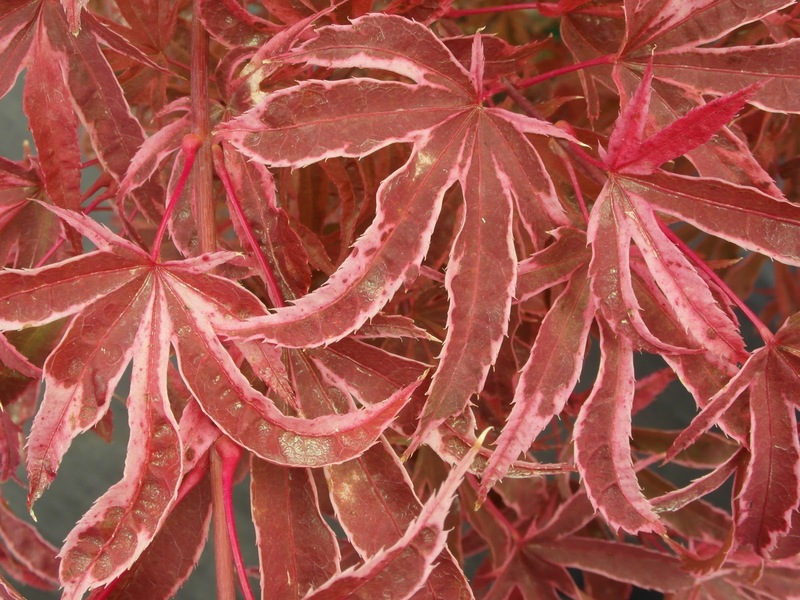 Acer palmatum 'Festival', a new selection, is noted for its yellow and orange October leaves. Acer palmatum 'Geisha Gone Wild' was the most impressive cultivar from spring through summer, yet still elevated itself to a higher level of color in the fall. 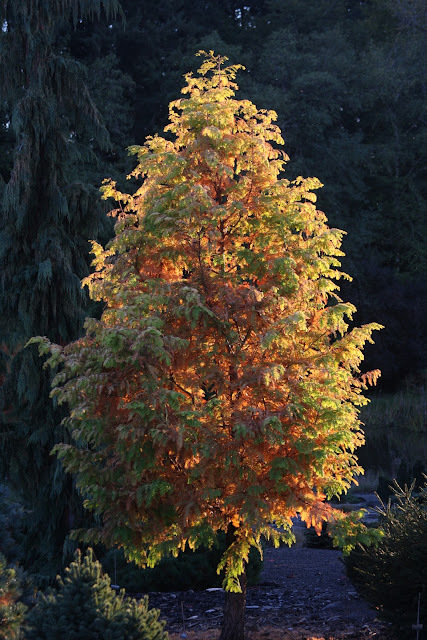 Acer palmatum 'Orangeola' and 'Adrian's Compact' treated me to a November 16th birthday's present of back-lit orange and red; for sure, no one has ever received a comparable present. 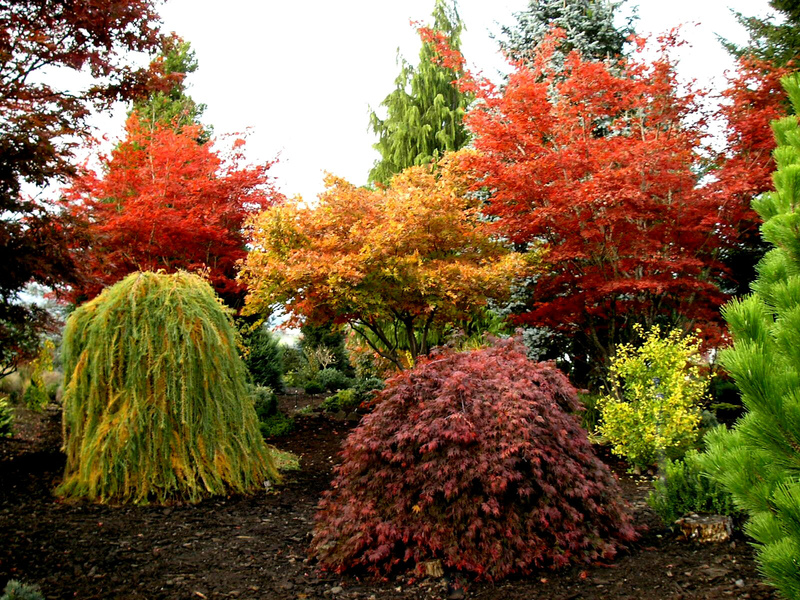 My God, my jaw dropped open on a November Sunday, when I wandered the nursery alone. Magical things happen when I can be with the plants, with no distractions from employees, customers (sorry) and crop-production issues. 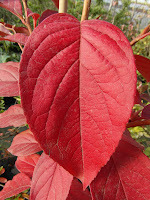 Wow!, the Stewartias were spectacular, with S. henryae 'Skyrocket' an intoxicating wine-red color. 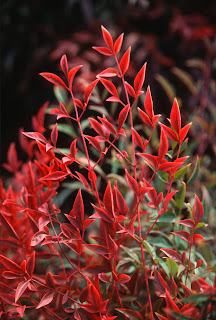 S. monadelpha 'Pendula', new from Japan, will be a high-priced favorite, with numerous pearl-white flowers blooming in July, then followed by yellow-orange-red leaves in autumn. 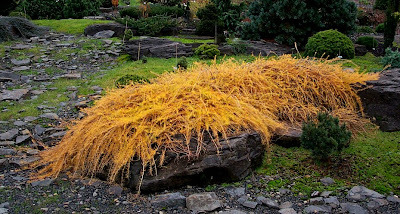 So how did Buchholz Nursery get this oriental treasure? Well, my Japanese wife, Haruko--beautiful and then in her twenties, skilled at floating with old nurserymen (like me)--she impressed upon Japan's Mr. S. that it would be wonderful to have a weeping Stewartia in America. 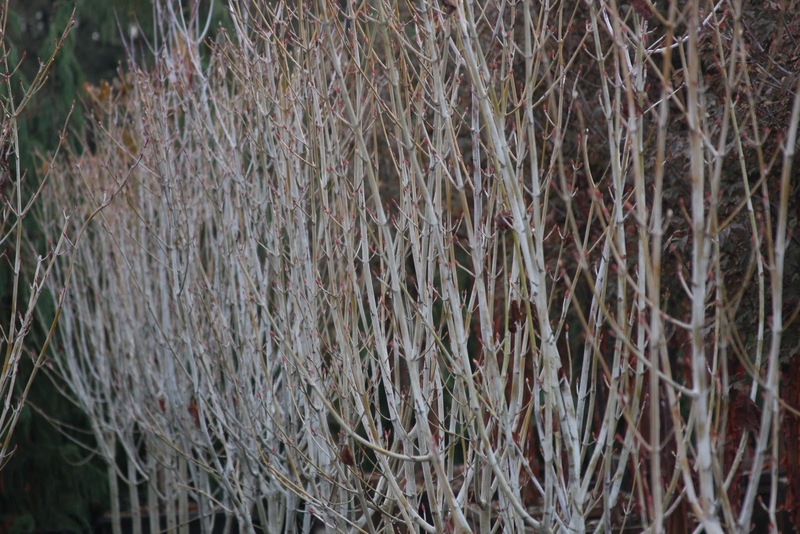 The following winter, I received two plants, as well as a weeping pink-flowered Styrax, 'Momo shidare', a compact white-flowered Styrax, labeled simply 'Dwarf' and another dwarf named 'Pink Compacta'. 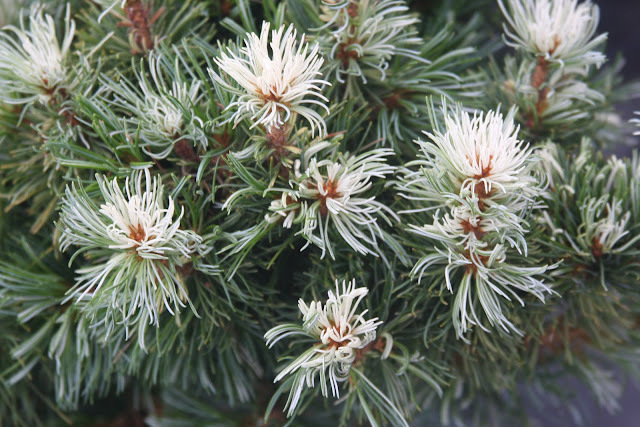 Also in the shipment were two variegated Davidias, 'White Dust' and 'Aya nishiki'. 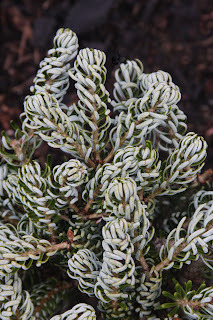 And more: a variegated Daphniphyllum--tentatively called 'Variegated'. Perhaps the most useful present in this fantastic shipment was Cornus kousa 'Ohkan'. 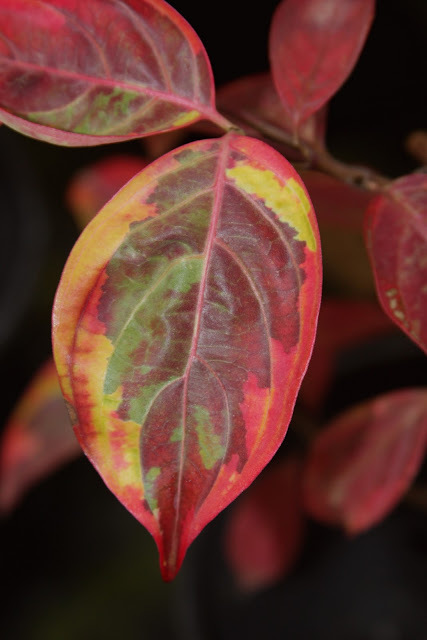 Mr. S-san gave me this variegated "Oriental Dogwood" which features lovely cream-white and green variegation in summer, followed by purple, red, green and yellow leaves in fall. Ok, I'll stop being coy, Mr. S-san can be identified as Akira Shibamichi, the godfather of Japanese nurserymen. Furthermore, after a long spring plant day that stretched late into the cold evening, he treated me to way-too-much warm sake at the local restaurant, and we both glowed with happiness. 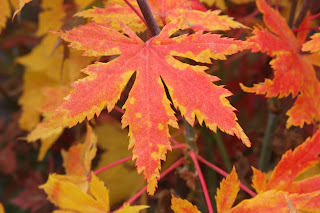 Back at the nursery my happy day was culminated by the two flats of Acer tegmentosum 'White Tigress'. These were produced by rooted cuttings from a single clone, but the fifty or so plants each displayed different fall color. I huffed on the camera lens, wiped if clean, then photographed the various leaves. We occasionally sell 'White Tigress' as a 6 to 10 foot tree, but these 4" pots would most likely be used as rootstock for our quick-to-sell-out Acer conspicuum 'Phoenix'. 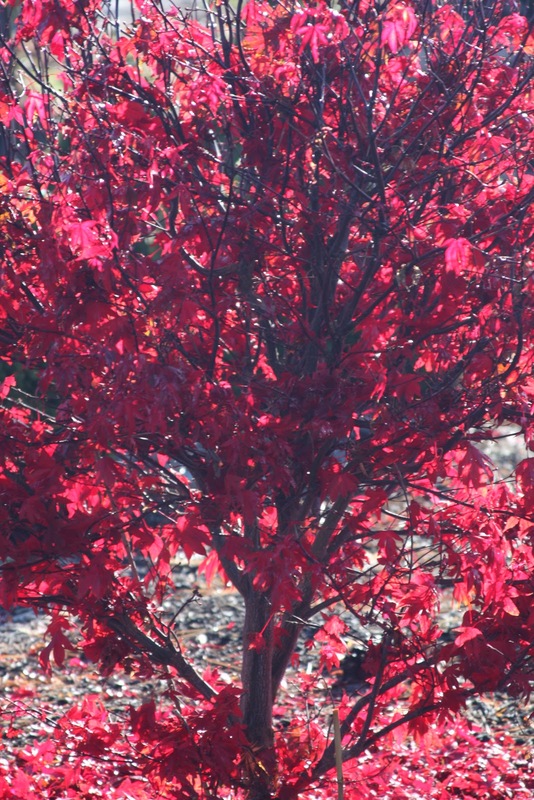 Well, there were dozens more fall-colored plants…or hundreds really, that impressed me this year. 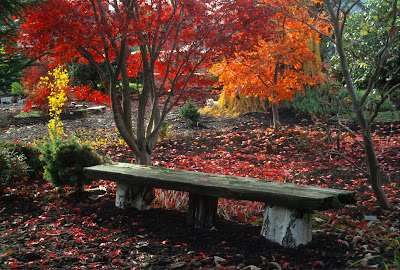 But now it's mid-December; the gardens still delight, just in a different way. So goodbye Acer griseum, Ginkgo biloba 'Tschi tschi' and Metasequoia glyptostroboides 'Matthaei Broom', we'll see you next year. 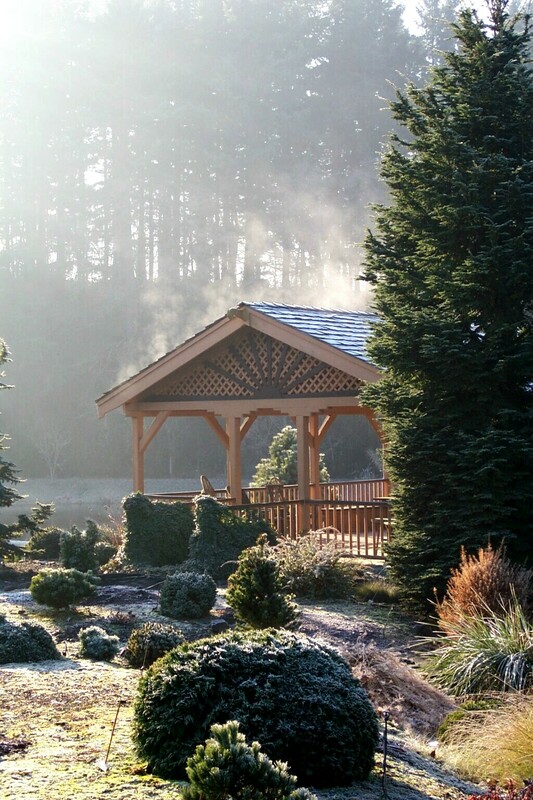 Next week we'll explore the winter garden, and the Flora Wonder Arboretum is well-equipped to please any plantsman in the dead of winter.